What can you do when you need to write a considerable number of User Stories in a very short timeframe? Why a User Story workshop? It is a useful tool to achieve the goal of writing many stories fast, especially when the development team has a lot of technical knowledge, or there is a lot of knowledge outside the team to be used to complement Product Owner’s domain knowledge. 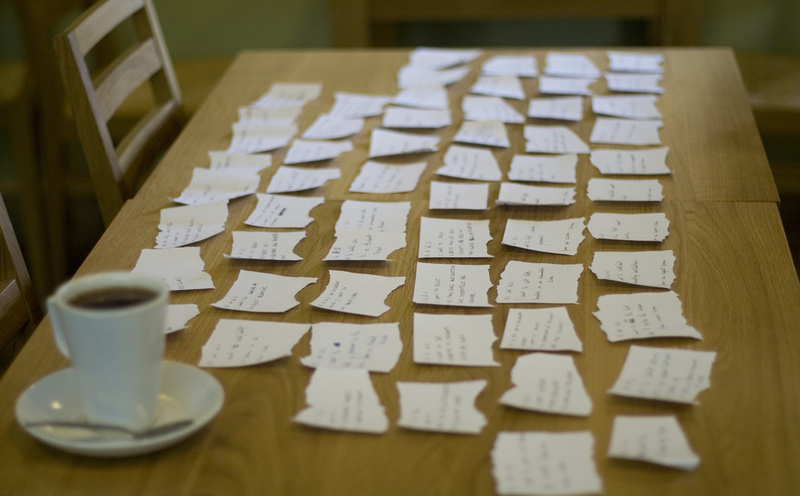 What is a User Story workshop? When starting a new Release, I suggest to run a a workshop with the Product Owner, the Development Team(s) which will build the specific product and all people who can contribute, regardless of their role. The goal of the workshop is to come out with as many User Stories as possible, which can solve the problem(s) represented by a given number of requirements. How to run a User Story workshop? The next iteration might continue on the same requirement or on a different requirement. Sometimes I tried other creativity techniques besides simple brainstorming, like Lateral Thinking techniques, e.g. the anti-solution. Especially if it is a newly formed team, not so used with writing stories, I provide a pattern to follow to brainstorm stories. - Who is the user who will benefit from the specific function? - What is the function which might contribute to solve a certain problem? - Why is that function needed (to solve which problem)? Generally speaking I found the User Story workshop very effective: it helps the team focus on the goal and make an efficient use of all brains around. You can easily write 50 User Stories of different granularity in 4 hours: sometimes more time is needed to achieve the intended goal, but I always prefer to start with no more than 4 hours and have other sessions if needed. In order to make the US workshop effective, the people involved should have been trained in what a User Story is and how to split the work in small slices which cut the system vertically and allows building an iteratively evolving product which continuously stays shippable. When needed, I propose and facilitate a very effective workshop to teach how and why splitting a product in small vertical slices: the Elephant Carpaccio exercise invented by Alistair Cockburn. I do recommend these 2 hours of learning, engagement and fun. What is preventing you to try it out tomorrow?